By Now You Have Heard The News!! 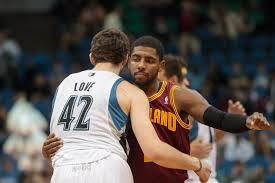 The Cleveland Cavaliers Will Trade Andrew Wiggins Anthony Bennett and 1st Rnd Protected Pick To The Minnesota Timberwolves for Kevin Love!!! Here’s A Quick Musical Tribute To Celebrate The Kevin Love Trade!!! This entry was posted in Cavs and tagged Cleveland Cavaliers, Minnesota Timberwolves on 08/05/2014 by withanohiobias.